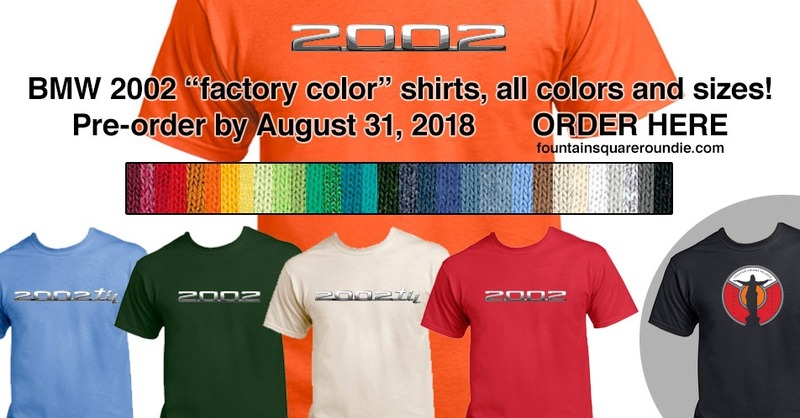 My daughter and I are selling 2002 "factory color" shirts to raise money for a big parts buy. (Suspension, brakes, etc.) All the colors, all the sizes! Please let us know the brand of tee shirt. My experience with pre-printed T-shirts isn't that great. The thin ones tend to shrink and wear out very quickly. The Hanes Beefy Tee (not sure if they still offer this) seems to be the best. In an effort not to squash your hopes of selling lots of shirts - what is your goal? Are you saving for the BLUNTTECH suspension refresh package? What brake package are you looking to install? I have a set of e21 vented front rotors I bought from another FAQ'r that I cannot use. Shirts are Gildan Ultra Cotton, their heaviest weight. The emblem artwork will be printed with traditional silk screen with five colors--white, black and three greys. For the suspension, yes, we're looking at the Blunt refresh package. Everything on ours is shot. Since we have the old-style stock 13" wheels, we'll probably keep the brakes stock--rebuilding the calipers and replacing everything else. Would vented fronts fit? For the back, friends gave us some 320i drum upgrade parts.